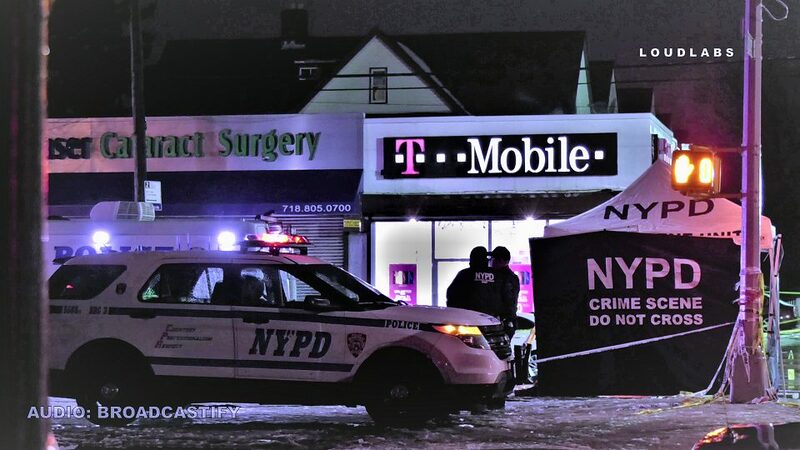 RICHMOND HILL, Queens (James P. O’Neill NYPD) – This evening at 6:10 p.m., two separate 911 callers reported a robbery in progress at a T-Mobile cell phone store located at 91-62 120th Street in Queens. The callers described the suspect as a male armed with a firearm. At least one of the callers said two employees of the store had been forced at gunpoint to the rear of the store. Detective Simonsen and his sergeant were in the area – working an unrelated case at the time – when they heard the call come over the radio. They did not hesitate. They responded immediately and pulled up as Patrol units arrived. Through the windows of the store, the officers did not see anyone inside. The officers then entered the store and immediately saw a man fitting the description of the suspect emerge from the back, pointing at them what appeared to be a handgun. With the suspect advancing toward them, the officers discharged their weapons and retreated out of the store. That was when Detective Simonsen was shot. His fellow officers put him in a marked police car and transported him here, where the trauma staff did their best to try to save him. We thank them for that. They were unable to do so, however. The sergeant, who has 8 ½ years with the NYPD, was shot one time in the leg. A passerby in a civilian vehicle stopped and helped him into the car and transported him here, also. He is listed in stable condition.